KP Readers are a Keypad and Proximity Reader combined to use with Switch2 and Net2 systems. 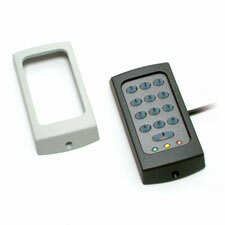 This allows card plus Pin (or code) access control with a single reader. The reader reads the token when it is held within close proximity and the control unit then verifies the Pin or Code to either grant or deny access.